The first volume of the new Black Panther reboot is my first completed book of 2017. I am not a huge fan of Marvel super-hero comics, but I’m always curious about comic books by interesting authors. A graphic novel by Ta-Nehisi Coates certainly qualifies as intriguing. I was not disappointed. 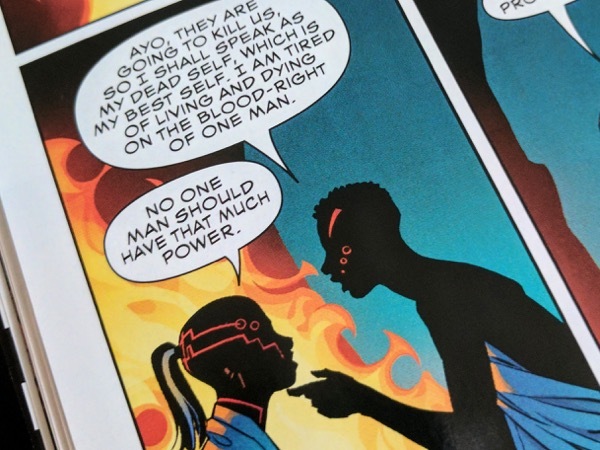 Coates is not an experienced sequential art writer and it shows – the book is heavy on exposition, and at times he tries too hard to make his characters sound profound. Even so, he does a great job of portraying a believable, complex character struggling with what it means to be a good ruler in the face of monarchy and awesome technological power. The main plot takes us through social unrest in Wakanda, where a psychic is revealing to the people their rage towards their king T’Challa, the Black Panther. 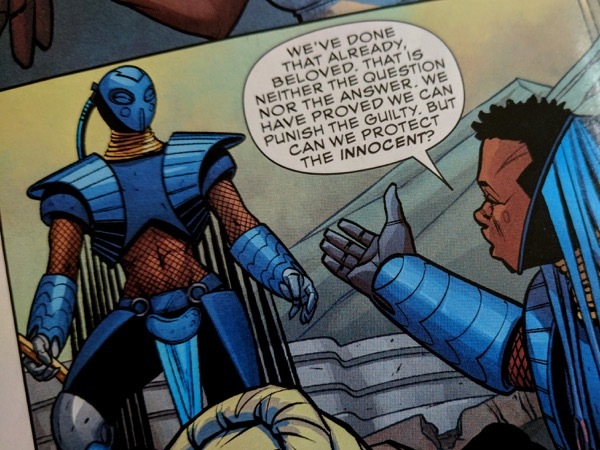 T’Challa himself is plagued by guilt and uncertainty about his own role. In a side plot, two of the Dora Milaje (the all-female elite royal guard of Wakanda) turn vigilantes, grappling with their own ethical issues around justice and power. But can we protect the innocent? Not only is the story is compelling, but the art and coloring are excellent. 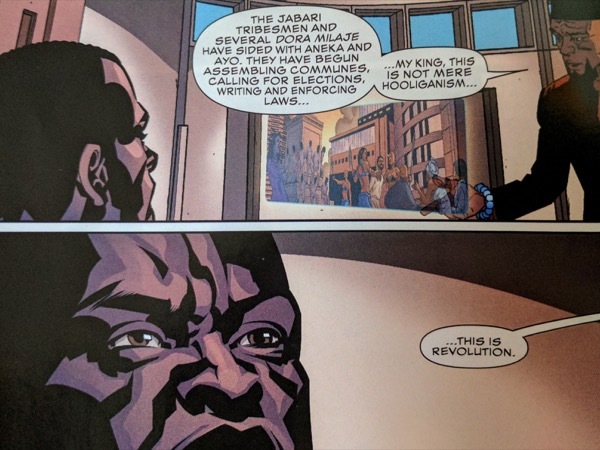 Artist Brian Stelfreeze and colorist Laura Martin do a great job of complementing Coates’ story with their visuals. Martin’s colors are a joy to look at – she tends to choose one dominating color for each spread, making each page turn a jump into a new little universe of its own. All in all, this was the perfect mix of thought-provoking story, a little bit of good old fisticuffs, and beautiful art. I’m looking forward to the next volume. No one man should have that much power, indeed.